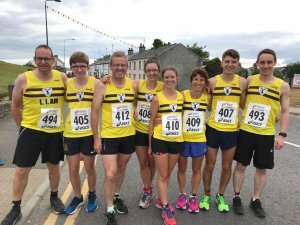 Tuesday evening saw the running of the Ballyvea 5 & 10k races in Silent Valley. Andrew Annett was the clear winner of the 10k race in 33:01. On Wednesday at the Shore 10k, Greg McClure ran 44:00 and Jim Clinton finished in 57:26. On Friday evening, nearly 1000 runners assembled on Newcastle promenade for the annual 5 and 10k run up and down the forest trails over the foothills of Slieve Donard. 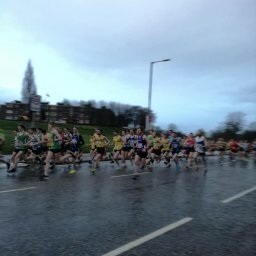 Several Harriers participated including; in the 10k, Kent Swann (1st M35) 36:51, Mark McAvoy 39:56, Jason Reid 49:43, Thelma McCullough (1st F60) 53:25, Gordon Glenn 55:25, Philip McIlwrath 56:12, Joanne McAllister 59:21, Philomena Donaldson 1:03:54, Catherine Seawright 1:05:36, Kathleen O’Neill 1:06:14, Trisha Murray 1:09:15, Eileen Keenan 1:09:17, Anne Marie Clarken 1:09:19 & Rosy Ryan 1:33:00. Friday evening also saw 10 Harriers take the starters gun in what is traditionally a highly competitive race. 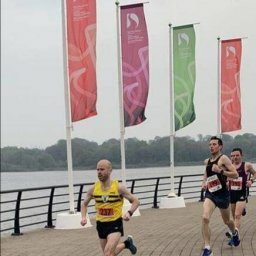 The Harriers were led home by Conal McCambridge in second place in a time of 15:18. Next home was his brother Brendan in a time of 17:35 (4th Junior and a 17 second PB). 3rd home for the club was Frankie Smyth 18:03 with a course PB in excess of 50 secs from last year. John Murphy followed Frankie home in 18:34 which was a PB for John. Next home was Paddy McCambridge who came home in 20:20 a seasons best. Ita was next home in 21:41 finishing first in her age group. Orla then came home in 22:27, closely followed by Catriona in 22:33, which was a 1:04 PB. 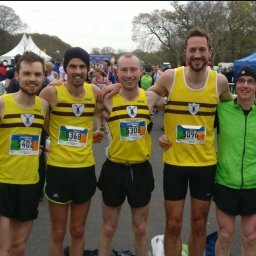 Louise O’Kane finished in a time of 26:48 whilst Liam Smyth ran 27:08, returning from a stress fracture injury. It was a great night of running. There were only 50 or so Harriers parkrunning on Saturday morning, but they attended a wide range of parkrun venues. Well done everyone.